27 x 38 mm 18K white gold case set with 86 brilliant-cut diamonds (approx. 1.8 ct), 7.5 mm thick, diamond crown set with a brilliant-cut diamond (approx. 0.1 ct), diamond bezel, white mother of pearl dial with two 18K white-gold hour markers, 690P quartz movement, black satin strap, folding buckle set with 40 brilliant-cut diamonds (approx. 0.3 ct). Water resistant to 03 ATM. 27 x 38 mm 18K white gold case set with 86 brilliant-cut diamonds (approx. 1.8 ct), 7.5 mm thick, diamond crown set with a brilliant-cut diamond (approx. 0.1 ct), diamond bezel, gem set dial with 293 brilliant-cut diamonds (approx. 0.9 ct) with hour-markers in 18k white gold, 690P quartz movement, black satin strap, folding buckle set with 40 brilliant-cut diamonds (approx. 0.3 ct). Water resistant to 03 ATM. 27 x 38 mm 18K white gold case set with 38 brilliant-cut diamonds (approx. 0.9 ct), black ceramic crown, 18K white gold bezel, silvered dial with fine grey roman numerals mark the hours in a scent of timelessness, caliber 690P quartz movement, black satin strap, ardillon buckle set with a brilliant-cut diamond (approx. 0.01 ct). Water resistant to 3 atm. 27 x 38 mm 18K white gold case set with 86 brilliant-cut diamonds (approx. 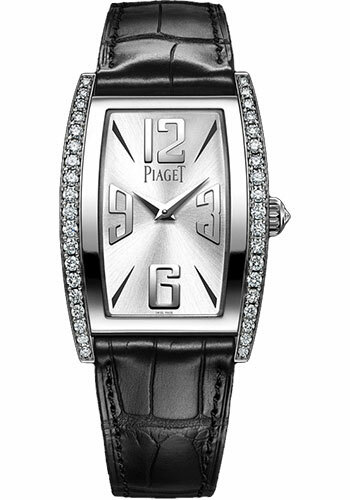 1.8 ct), black ceramic crown, 18K white gold bezel with diamonds, silvered dial with 292 brilliant-cut diamonds (approx. 0.8 ct) and 18K white gold hour markers, caliber 690P quartz movement, black satin strap, ardillon buckle set with 13 brilliant-cut diamonds (approx. 0.1 ct). Water resistant to 3 atm. 27 x 38 mm 18K white gold case set with 86 brilliant-cut diamonds (approx. 1.8 ct), rose-cut diamond crown, 18K white gold bezel with diamonds, silvered dial with 292 brilliant-cut diamonds (approx. 0.8 ct) and 18K white gold hour markers, caliber 690P quartz movement, 18K white gold bracelet set with 600 brilliant-cut diamonds (approx. 6.9 ct), folding clasp buckle. Water resistant to 3 atm. 27 x 38 mm 18K white gold case set with 86 brilliant-cut diamonds (approx. 1.79 ct), 8.1 mm thick, sapphire back with circular Côtes de Genève, circular-grained bottom plate and bridges, bevelled bridges and blued screws, black ceramic crown, 18K white gold bezel with diamonds, sapphire crystal, silvered dial with fine black roman numerals mark the passing hours to the rhythm, caliber 438P hand-wound movement, approximately 43 hours of power reserve, black satin strap, ardillon buckle set with 13 brilliant-cut diamonds (approx. 0.5 ct). Water resistant to 3 atm. 27 x 38 mm 18K white gold case set with 56 baguette-cut diamonds (approx. 3.11 ct), 8.2 mm thick, sapphire back with circular Côtes de Genève, circular-grained main plate and bridges, bevelled bridges, and blued screws, rose-cut diamond crown, 18K white gold bezel with baguette-cut diamonds, sapphire crystal, black dial with slender grey roman numerals mark the passing hours, caliber 438P hand-wound movement, approximately 43 hours of power reserve, black satin strap, ardillon buckle set with 13 brilliant-cut diamonds (approx. 0.05 ct). Water resistant to 3 atm. 27 x 38 mm 18K white gold case set with 38 brilliant-cut diamonds (approx. 0.87 ct), 7.4 mm thick, silvered dial with Roman numerals, black satin strap, ardillon buckle. Water resistant to 3 atm. 27 x 38 mm 18K white gold case set with 86 brilliant-cut diamonds (approx. 1.79 ct), 8.1 mm thick, sapphire back, white dial with Roman numerals, 438P hand-wound mechanical movement with minutes, hours, approximately 43 hours of power reserve, black satin strap, ardillon buckle. Water resistant to 3 atm.